Two scientists won the Nobel Prize in physics Tuesday for key discoveries about a cosmic particle that whizzes through space at nearly the speed of light, passing easily through Earth and even your body. Takaaki Kajita of Japan and Arthur McDonald of Canada were honored for showing that these tiny particles, called neutrinos, have mass. That's the quality we typically experience as weight. "The discovery has changed our understanding of the innermost workings of matter and can prove crucial to our view of the universe," the Royal Swedish Academy of Sciences said in awarding the prize. The work dispelled the long-held notion that neutrinos had no mass. Neutrinos come in three types, or "flavors," and what the scientists actually showed is that neutrinos spontaneously shift between types. That in turn means they must have mass. 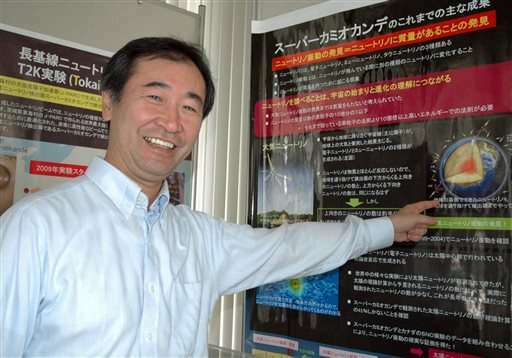 Kajita, 56, is director of the Institute for Cosmic Ray Research and professor at the University of Tokyo. 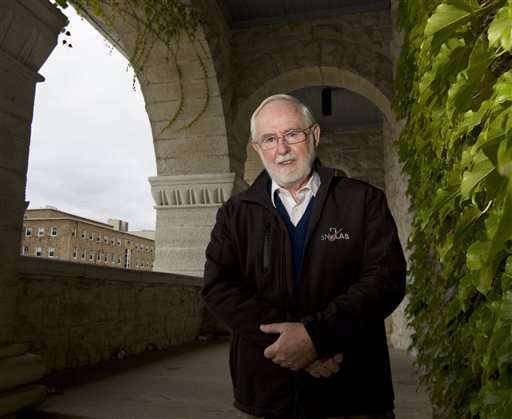 McDonald, 72, is a professor emeritus at Queen's University in Kingston, Ontario. 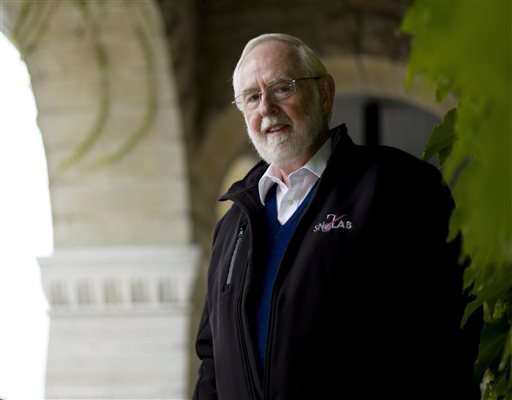 McDonald told reporters in Stockholm by phone that the discovery helped scientists fit neutrinos into theories of fundamental physics. 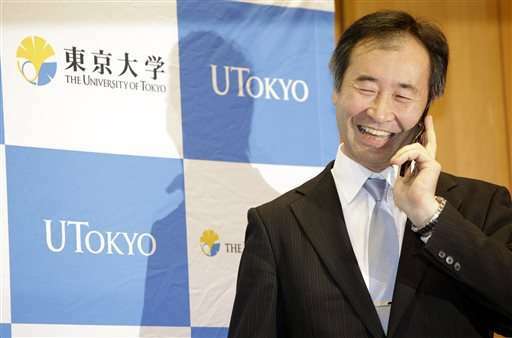 Kajita, who initially told a news conference at his university that "my mind has gone completely blank. I don't know what to say," went on to stress that many people had contributed to his work. 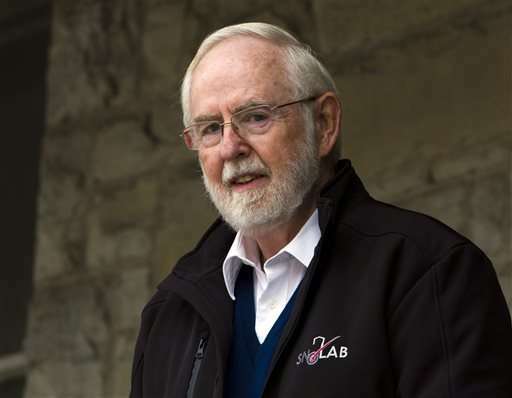 "The universe where we live in is still full of unknowns," he said. "A major discovery cannot be achieved in a day or two. It takes a lot of people and a long time." The existence of neutrinos was first proven in 1956. They come from a variety of sources in the cosmos, on Earth and in Earth's atmosphere. Most that reach Earth were created by nuclear reactions inside the sun. Trillions pass through your body every second. Kajita showed in 1998 that neutrinos created in Earth's atmosphere and captured at the Super-Kamiokande detector in Japan had changed "flavors." 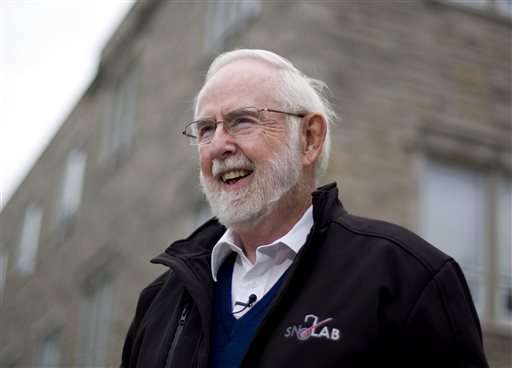 Three years later, while working at Canada's Sudbury Neutrino Observatory, McDonald found that neutrinos coming from the sun also switched identities. "It changes our understanding of the fundamentals of particle physics, and particles make up everything in the universe," said Robert G.W. Brown, chief executive officer of the American Institute of Physics. Antonio Ereditato, director of the Albert Einstein Center for Fundamental Physics at the University of Bern, Switzerland, declared, "This is really one of the milestones in our understanding of nature." The findings "really inspired a whole global community of scientists to drop what they were doing and try to understand the neutrino," said Joseph Lykken, deputy director of the Fermi National Accelerator Laboratory in Batavia, Illinois. Still unknown: Just how much do neutrinos weigh? "Neutrinos are a million times lighter than an electron, which is a charged version of a neutrino," said Guido Drexlin, a neutrino expert at the Karlsruhe Institute of Technology in Germany. Determining their weight is something his team hopes to start working on next year. 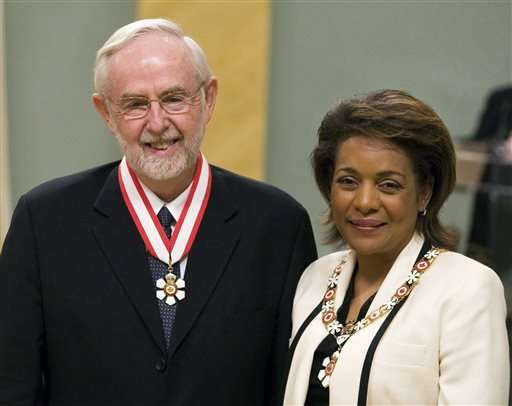 The Nobel winners will split the 8 million Swedish kronor (about $960,000) prize money. Each winner also gets a diploma and a gold medal at the prize ceremony on Dec. 10. 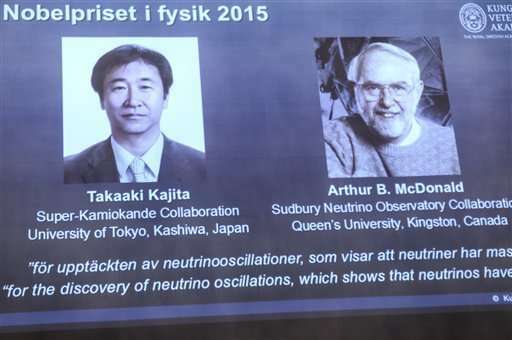 The Nobel Prize in Physics 2015 recognises Takaaki Kajita in Japan and Arthur B. McDonald in Canada, for their key contributions to the experiments which demonstrated that neutrinos change identities. This metamorphosis requires that neutrinos have mass. The discovery has changed our understanding of the innermost workings of matter and can prove crucial to our view of the universe. 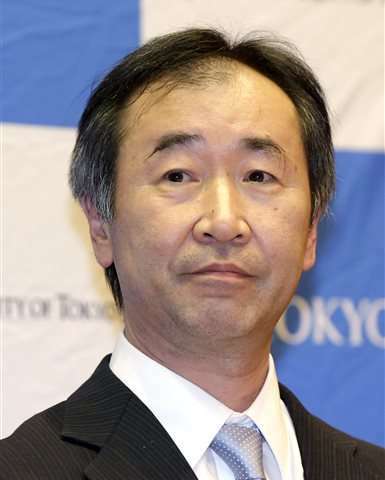 Around the turn of the millennium, Takaaki Kajita presented the discovery that neutrinos from the atmosphere switch between two identities on their way to the Super-Kamiokande detector in Japan. Arthur B. McDonald could demonstrate that the neutrinos from the Sun were not disappearing on their way to Earth. Instead they were captured with a different identity when arriving to the Sudbury Neutrino Observatory. A neutrino puzzle that physicists had wrestled with for decades had been resolved. Compared to theoretical calculations of the number of neutrinos, up to two thirds of the neutrinos were missing in measurements performed on Earth. Now, the two experiments discovered that the neutrinos had changed identities. For particle physics this was a historic discovery. Its Standard Model of the innermost workings of matter had been incredibly successful, having resisted all experimental challenges for more than twenty years. However, as it requires neutrinos to be massless, the new observations had clearly showed that the Standard Model cannot be the complete theory of the fundamental constituents of the universe. The discovery rewarded with this year's Nobel Prize in Physics have yielded crucial insights into the all but hidden world of neutrinos. After photons, the particles of light, neutrinos are the most numerous in the entire cosmos. The Earth is constantly bombarded by them. Many neutrinos are created in reactions between cosmic radiation and the Earth's atmosphere. Others are produced in nuclear reactions inside the Sun. Thousands of billions of neutrinos are streaming through our bodies each second. Hardly anything can stop them passing; neutrinos are nature's most elusive elementary particles. Now the experiments continue and intense activity is underway worldwide in order to capture neutrinos and examine their properties. New discoveries about their deepest secrets are expected to change our current understanding of the history, structure and future fate of the universe. True or false: How well do you know Nobel Prizes? Excerpt: "McDonald said that scientists would still like to know the actual masses of the various forms of neutrino. And experiments are looking at whether there are other types of neutrinos beyond the three clearly observed." My comment: They have added weight to the argument made by Schrodinger in "What is Life" for considering the sun's biological energy as the anti-entropic energy source of all the earth's biomass. It will be interesting to see if the 2015 Noble Prize in Chemistry also links the sun's biological energy from the weight of the argument from these physicists to the works by the 2015 Nobel Laureates in Physiology and/or [traditional] Medicine. The Neutrino Oscillation of the Weak Interaction shows that it is a General electric dipole change and it is possible to any other temperature dependent entropy and information changing diffraction pattern of atoms, molecules and even complicated biological living structures. Thank you. Do you think that physicists can now communicate through chemists and convince any biologically uninformed evolutionary theorists that they are science idiots? Do you think anyone else will link the speed of light on contact with water to the de novo creation of nucleic acids and all biomass via biophysically constrained nutrient-dependent protein folding chemistry, which is RNA-mediated? RNA-directed DNA methylation links the sun's biological energy from the de novo creation of light-induced amino acids and RNA-mediated gene duplication to RNA-mediated amino acid substitutions and cell type differentiation via metabolic networks and genetic networks in all living genera. Information that links physics, chemistry, and molecular epigenetics via RNA-mediated events such as the de novo creation of olfactory receptor genes will be posted here to encourage discussion of a paradigm shift, which links nutrients to healthy longevity and viruses to pathology. The shift leads away from pseudoscientific nonsense about mutations and evolution to what is currently known by serious scientists about the biophysically constrained nutrient-dependent chemistry of RNA-mediated protein folding. I'm still partial to the view that neutrinos have imaginary mass (which is still largely consistent with the data, which measures the square of the mass and has a confidence interval that goes down below zero.) In what sense the mass is imaginary is a good question; in Clifford algebra there are many different entities that have negative squares. The only type of hypothesized stable particle that would have imaginary mass is the tachyon, or faster-than-light particle. I have heard that imaginary mass is far more often a sign of an unstable and decaying particle. Maybe each neutrino type "decays" into the next in a cycle? Given that the type of neutrino changes as it travels, its mass could be expected to change, too. Perhaps the mass is actually a complex phasor which rotates between imag. and real, but can only interact with other matter at precisely the right phases in that cycle. Maybe we could one day make some sort of high-resolution neutrino telescope, which could peer into deep space and examine energetic objects through dust clouds and such which ordinary EM spectrum telescopes have a hard time dealing with. Like have a really large field of collectors, perhaps a square kilometer in total and every square meter or so would be a "pixel" to try to detect a neutrino. You might take exposure times of a few seconds to a minute or so and do this each day (Earth rotation means you only get a few minutes looking at the same object each day) and over a period of a few days build up a high resolution composite image of your source object. These things might be important considerations for theoretical physicists who cannot address the facts about why the Nobel Prize in Physics was awarded for works that can be linked to Schrodinger's claims and to Darwin's claims, which required others to place "conditions of life" before natural selection. Neo-Darwinists didn't do that. We've heard from three biologically uninformed science idiots who could comment on how physics is linked to biology, but instead are commenting on ridiculous theories. "The imprimatur of science should be awarded only to a theory that is testable." I'm not sure I understand the complex mechanism by which the neutrino converts to a lepton partner (through Z &/or W Bosons) but since they are relativistic then is much of their 'mass' contributed by their high v? That is, if the neutrino has enough energy it converts to a lepton via Z or W how much of the 'mass' would be the result of such a process and how would that be measured? Appreciate a little help here, thanks. Excerpt: "...neutrinos are just one of many surprises from the subatomic realm that physicists encountered during the 20th century. I can think of at least 10 more..."
Obviously, there are several participants here who could think up at least 10 more each. As we wait for the Nobel Prize in Chemistry to be announced, let's see how many other ridiculous theorists the biologically uninformed science idiots here think have any explanatory power whatsoever in real world. Energy is mass E=m*c^2. All matter and light is energy and thus mass. There are two types of mass kinetic-energy T=m(k)*c^2 and potential energy mass V=m(p)*c^2. So how can any physicist have been so utterly stupid to believe that a neutrino has no mass? And how can a Nobel Prize be awarded if the masses of neutrino's with different "flavours" (LOL) are not yet known? It is utter nonsense! They should have some sort of web site, lets call it "Zerphyr-nonsense" which would allow a user to input key words for a topic, and a number of pages, and number of citations, and then the site would randomly generate nonsense papers of that length with valid citations to to valid books, papers, and other sources on the topic. It would be great for helping students pass college, and it would be a true...monument... to Zerphyr's contribution to science. There is no neutrino particles. There is propagating vibrations in the structure of vacuum of space. If they have mass then how can they move at the speed of light? I have also been wondering exactly what is the difference between the three kinds of neutrinos other than their origins or the decay process that created them?? > Neutinos don't move. Neutrino properties are quantum teleported thereby giving rise to an illusion of velocity. Neutino flavours are interference patterns resulting from entanglement weak decoherence. Research that links the speed of light on contact with water to the de novo creation of nucleic acids and all RNA-mediated cell type differentiation in all living genera may need to be compared to an alternative model that links atoms to ecosystems. It would appear that neutrinos travel just as fast as the speed of light. So I still do not understand how they can have mass and travel at the speed of light? "Neutrino emissionsApproximately two to three hours before the visible light from SN 1987A reached Earth, a burst of neutrinos was observed at three separate neutrino observatories. This is likely due to neutrino emission, which occurs simultaneously with core collapse, but preceding the emission of visible light. Transmission of visible light is a slower process that occurs only after the shock wave reaches the stellar surface. " Does anyone know why Captain Stumpy claims this is a CREATIONIST PERSONAL PSEUDOSCIENCE PHISHING SITE? Easily, the Nobel Prize has been awarded for finding, that the mass of neutrino is not constant, i.e. that it oscillates - not for finding of its exact value. The posts to the group can be seen without applying for membership in the group. What other FB groups or pages are not permitted to be linked as information sources on content posted to phys.org? Why doesn't Captain Stumpy simply admit that he thinks he should be able to censor the distribution of any content he does not want others to learn about? Excerpt: "Small intranuclear proteins also participate in generating alternative splicing techniques of pre-mRNA and, by this mechanism, contribute to sexual differentiation in at least two species, Drosophila melanogaster and Caenorhabditis elegans..."
The 2015 Nobel Prizes confirm that the mechanisms extend to all cell type differentiation. Quote docile: "They don't travel exactly with speed of light, we already have number of experimental results, which prove, their speed is slightly subluminal." I have never read about neutrino velocity being slightly slower than the speed light, please provide me with some links, thanks. Besides it would appear by the link I provided neutrinos may travel slightly faster than the speed of light. After all we know that light waves travel slower in denser mediums. "Approximately two to three hours before the visible light from SN 1987A reached Earth, a burst of neutrinos was observed at three separate neutrino observatories." I have never read about neutrino velocity being slightly slower than the speed light, please provide me with some links, thanks. Don't listen to docile. If there were such results we would know the mass of the neutrino, which we don't. Besides it would appear by the link I provided neutrinos may travel slightly faster than the speed of light. After all we know that light waves travel slower in denser mediums. Neutrino's travel at or close to the speed of light in vacuo from the moment they are generated in some nuclear reaction, but not any faster of course. The same nuclear reaction heats up matter, presumably creating a plasma that does not transmit light. It takes some time for this energy to be convected to the region where the light is generated. Also the propagation of light is speed is slower than "c" in matter. Of course you are right, on both points. Docile mentions a link but never provide the link. Neo-Darwinian theory has acquired supporters whose beliefs in pseudoscientific nonsense have become their religion, which has been entered into mainstream science by the repeated assertions of biologically uninformed science idiots. The ridiculous assertions have repeatedly been challenged with experimental evidence, like that used to support the awarding of Nobel Prizes in Physics, Chemistry and Physiology and/or Medicine. Clearly there can be no argument about what is mainstream science vs what is pseudoscience. Evolutionary theory has never been exemplified in the context of an atoms to ecosystems model of biologically based cause and effect. Virus-driven pathology and nutrient-dependent healthy longevity have been exemplified by serious scientists. Why is Captain Stumpy allowed to keep touting the pseudosceintific nonsense of his religion? @inkosana I must admit that I am sometimes a bewildered by the Nobel Prize process but then I haven't looked up the procedure. I can understand that that in Newtonian physics matter and energy might be treated separately and that in SR matter and energy are joined together as far as conservation of the whole is concerned. But what makes me wonder is that I read somewhere that a neutrino might gain extra kinetic energy on route and it is this KE that can provide the extra needed for oscillation between 'colours'. I don't want debate that particular point but am concerned with the production on neutrinos apparently close to c therefore according to SR they would need a vast amount to either get closer to or move at c as well as frequency changes etc. What's your view on this? @Mimath224: Newton treated mass and energy separately since he guessed wrongly that the momentum must be written in terms of a speed-invariant mass m(0): i.e. that p=m(0)*v and that therefore F=m(0)*(dv/dt)=m(0)*a. If he would have guessed that p=m*a so that F=(dm/dt)*v+m*(dv/dt)=(dm/dt)*v=m*a, his laws as derived subject to Galileo's relativistic transformation would have been totally commensurate with the Lorentz relativistic transformation. Thus, the motion of the centers of mass of matter objects are not determined by the Lorentz transformation, except for the fact that the total mass of a moving object is MORE than its rest mass. The transformation of time is required when light-waves are being transformed, since the PHASE TIME of the light-wave changes. It is not required because REAL TIME changes: The latter MUST always be the same everywhere at the SAME instant in time. Einstein was absurd to argue that the SAME instant in time is occurring at different times. But what makes me wonder is that I read somewhere that a neutrino might gain extra kinetic energy on route and it is this KE that can provide the extra needed for oscillation between 'colours'. I don't want debate that particular point but am concerned with the production on neutrinos apparently close to c therefore according to SR they would need a vast amount to either get closer to or move at c as well as frequency changes etc. What's your view on this? It can be shown from Maxwell's equations that a single electromagnetic wave RESONATES by borrowing small amounts of energy delta(E) for a limited allowed times delta(t). Both a matter-entity and a light-wave are EM waves, each having a total energy m*c^2 and their energies oscillate in this manner when they resonate. The fact that neutrino's do this when they resonate in order to be captured does NOT "prove" that a neutrino has mass since it ALWAYS has mass equal to m*c^2. "Massless" means not to exist! @inkosana, Yes I realise these points from your standpoint but that is not what really what I asked. Was asking you to consider from an SR standpoint. What do you think happens to the neutrino in the SR context. All the articles are available to read and/or download for free --for ~10 more days. I look forward to your comments if you are willing to read any of the articles for comparison to what is known about the de novo creation of nucleic acids and biodiversity. Maxwell's equations describe pure abstract transverse light waves without any background effects. It models REAL EM waves. It these waves are not real we would not have had radio, TV, microwave ovens, cell phones etc. Photons are not "solitons": A photon is a SINGLE, COHERENT, EM wave with transverse electric- and magnetic components, like any other coherent light wave. They were not known at that time. Of course you can derive the existence of ANY light-wave from Maxwell's equations; also one with energy hf. Must be a dearth of articles on evolution. JVK has to vent his bio-babble on a physics article. There are plenty of evolution articles on PO. JVK avoids commenting on them because his bio-babble is no use to him on those articles. His only refutations would have to based on his young earth creationists beliefs. ...major issues remain unsolved, such as the origin of a genetic code. Limestone caves are caused by bacteria oxidising hydrogen sulphide to produce sulphuric acid. This series of articles starts with how life shaped earth, not with the physics and chemistry of what is currently known about the requirements for the de novo creaation of the first cell type of of any other nutrient-dependent cell types that arose via the conserved molecular mechanisms of RNA-mediated amino acid substitutions and the physiology of reproduction. Thanks to all the theorists who have shown that they will continue to ignore everything known to serious scientist in their hopes to convince others that their ridiculous theories explain something. His only refutations would have to based on his young earth creationists beliefs. The literature that link this year's Nobel Prizes in physics, chemistry, and physiology and/or medicine is cited in many different articles about the role of viruses in perturbed protein folding that links physics to chemistry and the conserved molecular mechanisms of DNA repair that prevent virus driven genomic entropy and enable biodiversity via the physiology of reproduction. See anything made readily available via a search for "rna mediated"
Alternatively, keep touting your pseudoscientific nonsense while claiming that creationists are biologically uninformed. "The fossils that help geologists to identify the layers of the Earth's crust and biologists to make sense of the evolution of life remind us that we are walking on many layers of past life. When animals started building hard shells or internal skeletons some 540 million years ago, they made the fossil record more diverse and interesting — and they may have wiped out much of the previous biodiversity." Strange link from a young earth creationist like JVK. By definition creationists are biologically uninformed. They are also geologically uniformed, that's the choice they make when trying to support their creationist world view despite the fact that their views are totally lacking any scientific validity. By whose definition are creationists biologically uninformed. "...the so-called alpha chains of hemoglobin have identical sequences of amino acids in man and the chimpanzee, but they differ in a single amino acid (out of 141) in the gorilla. ( p. 127)"
See also: "I am a creationist and an evolutionist. Evolution is God's, or Nature's, method of Creation. Creation is not an event that happened in 4004 B.C. ; it is a process that began some 10 billion years ago and is still under way." -- from the same review of what we know is RNA-mediated cell type differentiation that occurs over the weekend in at least one species of bacteria that re-evolved the flagellum. See: http://www.the-sc...ewiring/ with my comments to The Scientist on Lenski's nonsense. Dobzhansky did call himself a creationist but more accurately he was theological evolutionists, unlike young earth creationists who base their science on Genesis, which was based on Babylonian myths. "Creation is not an event that happened in 4004 B.C. ; it is a process that began some 10 billion years ago and is still under way." That statement is refutation of Genesis and separates him from you and your co-delusional young earth creationists. Jvk, are you really so desperate for attention you need to hijack the ccomment section of an article about the winners of the Nobel prize and why they were chosen? Jfc man. Go spam the hell out of your own sites and Facebook groups. Have you ever considered seeing a psychiatrist for evaluation? They probably have medicines that can help your extreme mental illnesses. So are there any science sites that have discussion forums where moderators actually ban people for repeatedly posting pseudo-science to every topic? I'd love to find a site that has intelligent discussions and people ask legitimate questions on these types of articles instead of wading through 20 posts of crap, another 10 trying to correct the crap, and another 40-50 of insults to find the three decent comments buried within. If it's some sort of secret site please just PM it to me! So are there any science sites that have discussion forums where moderators actually ban people for repeatedly posting pseudo-science to every topic? JvK is desperate off-topic spammer. That fact integrates everything currently known about physics, chemistry, and biology via the conserved molecular mechanisms that led to re-evolution of the bacterial flagellum in 4 days. Why can't intelligent comments that address the nutrient-dependent ecological adaptations that link atoms to ecosystems be discussed here? Excerpt: They move at roughly half the speed of light to avoid being dragged into the nucleus by the powerful positive charge from the protons in the nucleus, and that causes a lot of relativistic effects. Because the electrons are moving so fast, the separate electron shells appear to be closer than they actually are. For an electron to jump to a higher energy level it needs to absorb a specific wavelength of light. In gold, the wavelengths that could be absorbed are usually in the ultraviolet range – beyond what we can see." Hugo de Vries called these energy jumps "mutations." Sutherland's group showed how ridiculous it was to use that definition in the context of biology. H2S supposedly was common on early Earth. So was the UV radiation that could drive the reactions and metal-containing minerals that could have catalyzed them. Excerpt: "...a simple peptide synthetase ribozyme might evolve into an increasingly large and complex system of molecular alignment, leading to the modern ribosome. Indeed, the ribosome can be thought of as essentially an entropy 'trap' for carefully aligned substrates ,"
Given the overwhelming complexity of this entropy 'trap,' how do biologically uninformed science idiots link it to all of life's biodiversity without citing Schrodinger (1944) and Dobzhansky (1973) who linked the sun's biological energy to a single amino acid substitutions and the differentiation of primate cell types? So are there any science sites that have discussion forums where moderators actually ban people for repeatedly posting pseudo-science to every topic?... PM it to me! Hugo de Vries called these energy jumps "mutations." If I tried to substitute a definition in links from the sun's biological energy to RNA-mediated cell type differentiation in all living genera, it would be a clear sign of dementia. The clinically actionable genotypes among all patients are RNA-mediated and viruses perturb protein folding that often requires clinical action to prevent further genomic entropy. "Due to the damaging effects that mutations can have on genes, organisms have mechanisms such as DNA repair to prevent or correct mutations by reverting the mutated sequence back to its original state." The 2015 Nobel Laureates in Chemistry linked nutrient-dependent RNA-mediated DNA repair to healthy longevity. If they had linked mutations to evolution, they could not have been considered to be serious scientists. In biology, a mutation is a permanent change of the nucleotide sequence of the genome of an organism, virus, or extrachromosomal DNA or other genetic elements. you mean like LENSKI? the actual EVIDENCE you keep ignoring? perhaps you should start at the beginning? My argument is that virus-induced genomic entropy must be controlled by an anti-entropic force. Others have been making that claim since Schrodinger (1944) or perhaps even before then. Neo-Darwinists claimed that "natural selection" is the anti-entropic force, which subjected the entirety of all other claims to ridicule by all serious scientists. 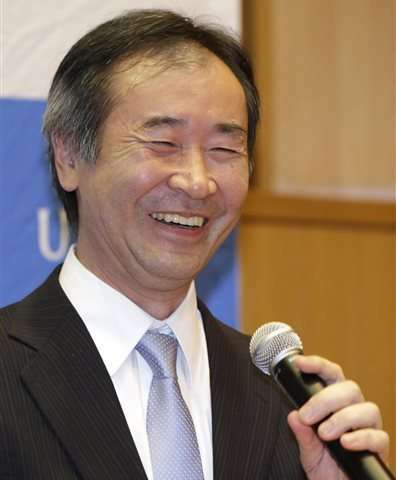 Masatoshi Nei removed "natural selection" from his claims about constraint-breaking mutations, but never mentioned how they were either linked from viruses or controlled by what is currently known about the physics, chemistry, and conserved molecular mechanisms of RNA-mediated cell type differentiation. Tell us why you think that all serious scientists since Schrodinger -- including the 2015 Nobel Laureates in Physics, Chemistry, and Medicine, are wrong about the need for an anti-entropic force, or why Lenski is right to ignore what every serious scientist knows is required to link biologically-based cause and effect. Why do you continue to make such ridiculous claims about MY argument. Tell us what you know about the link from neutrinos to nucleic acids. Stop touting pseudoscientific nonsense about mutations and evolution. JVK, entropy IS information. The negative sign is only there because when taking the log of a number less than 1 (probabilities are less than 1) you get a negative number, while we want a positive number. Absolute value instead of negation would work just as well. The less entropy in a DNA sequence, the less information it can carry. Anti-entropic forces are not hard to find in open thermodynamic systems. Error correction is anti-entropic, and has many known physical implementations. Homeostasis of temperature is anti-entropic, through convective and evaporative cooling. The amount of entropy expelled through a single person sweating on a hot day is bound to be many orders of magnitude greater than all the entropy added to the genome through mutations in the whole species over the course of many generations. Anti-entropic forces are not hard to find in open thermodynamic systems. Agreed. That forced theorists to invent differences between open and closed systems so that a passing asteroid could be linked to chirality. But Schrodinger (1944) claimed the anti-entropic energy of the sun was a more likely link from substitution of achiral glycine in the GnRH decapeptide to cell type differentiation in all vertebrates compared to mutations before anything was known about how RNA-mediated events link biophysically constrained protein folding chemistry to cell type differentiation of all cells in all individuals of all living genera via amino acid substitutions. Given your knowledge of entropy as information, how are neutrinos linked to nucleic acids outside the context of the speed of light and an atoms to ecosystems model of energy-dependent life that starts with links from Sutherland's group to the claims of the 2015 Nobel Laureates in Physics? Excerpt: "The specific modular organization of the connectomes requires fewer rules to construct it (lower algorithmic entropy), or fewer genetic factors to develop such a neural system. Together, these results show that neural systems across different levels, from the network of neurons to the network of brain regions, commonly have efficiencies in the multiple aspects listed above." How does a theorist address the fact that the connectomes of nematodes and humans are built upon the biophysically constrained chemistry of nutrient-dependent RNA-mediated protein folding? Viruses, for comparison link entropic elasticity to genomic entropy via perturbed protein folding. Excerpt: "We proposed that, besides "negative entropy," organisms sense the environment to extract latent embedded information.13 By latent information we refer to data embedded in the environment that, once processed cognitively, initiates change in the organism's function or behavior. Information induces changes; hence it can be used to generate an internal condensed description (model or usable information) of the environment, which guides the organism's functioning." Alternatively, admit that no one here understands enough about biophysically constrained nutrient-dependent RNA-mediated cell type differentiation to link what they know to anything already known by serious scientists. Excerpt: In a limited capacity, mutations actually aid evolution. There have to be changes for natural selection to act on, so these DNA mutations are a significant factor in Darwin's theory of evolution. My comment: Neo-Darwinists invented the theory about mutations, natural selection, and evolution. Their assumptions were based on de Vries definition of "mutation." "Conditions of life" were the most significant factor in Darwin's theory. Conditions of life are RNA-mediated in the context of nutrient-dependent gene duplication and RNA-mediated amino acid substitutions that are fixed in the organized genomes of species from microbes to humans in the context of their physiology of reproduction. The amino acid substitutions stabilize organized genomes in the context of RNA-mediated DNA damage repair and an atoms to ecosystems model of biologically-based cause and effect. My comment: blah blah LIES blah "mutation." My comment: Neo-Darwinists invented the theory about mutations, natural selection, and evolution. JVC, I don't think there are any two natural phenomena on Earth that have less to do with each other than neutrinos and amino acid physiology. Your posts are word salad, almost diagnostic of severe mental illness. I know you enjoy your theory obsession, but you are clinically deluded if you think that you are making a visionary scientific contribution. This sort of combination of delusion and obsession is likely burning your mind to a crisp. If you have depressive episodes, talk to a psychiatrist and get on a mood stabilizer; if not, get a trial of an anti-psychotic. EWH: Thanks for your ongoing support of pseudoscientific nonsense. Your claim arrives at just the right time to place it into the realm of ignorance exemplified by others. What kind of biologically uninformed science idiot does not think neutrinos must be linked to the de novo creation of amino acids that epigenetically link metabolic networks and genetic networks to the biophysically constrained structure of DNA? That was a rhetorical question. Note: None of my antagonists (i.e., anonymous fools, like EWH) has ever offered an alternative model that links the starting materials for the synthesis of nucleic acids—cyanamide, cyanoacetylene, glycolaldehyde, glyceraldehyde and inorganic phosphate—to the plausibility of prebiotic feedstock molecules activated by the sun's biological energy. Oddly, I seem to be one of few survivors of the damage to DNA in brain cells that is done by cosmic radiation. Could it be the "tin-foil" helmet, or nutrient-dependent RNA-mediated amino acid substitutions that have led to my mental stability compared to whatever led to the ignorance and arrogance of nameless people like EWH. The model also appears to link Schrödinger's claims about the anti-entropic energy of sunlight to nutrient-dependent base pair changes in bioluminescent microbes and to RNA-mediated cell type differentiation in all individuals of all living genera via their physiology of reproduction and the supercoiled DNA that prevents virus-driven genomic entropy. The viruses pirate the nutrient-dependent energy (e.g., light energy) that bacteria and plants need to reproduce. Their reproduction provides an ecological foundation for the food chain that links all life on Earth to the sun's biological energy via top-down causation in the context of quantum physics, quantum chemistry, quantum smell, quantum biology, and quantum consciousness as demonstrated in works by Luca Turin's group and by Anna Di Cosmo's group.